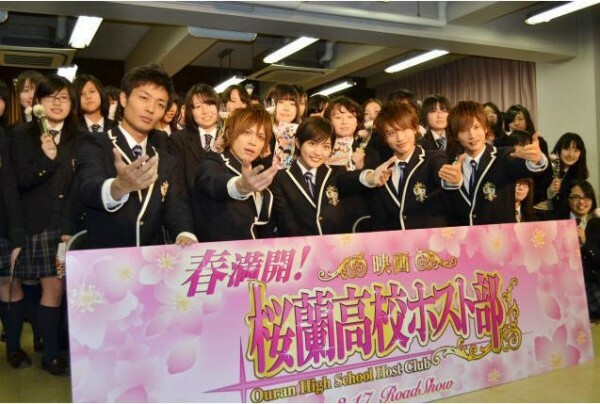 On February 17th, the cast of the upcoming film, "Ouran High School Host Club", made a surprise visit to Shinagawa Etoile Girls High School. The cast made a sudden appearance as the students gathered in the music room to watch the spin-off drama, "Ouran High School Host Club~Haruhi no Happy Birthday Daisakusen~". The students screamed with joy and excitement, especially after the members handed each girl a flower. Prior to the visit, the school held a survey asking their students, "If there was host club at school, what kind of services would you want?" To grant their wishes, the 'host club' carried out the various services listed for the students. Nakamura Masaya, who entertained the girls by massaging their shoulders, revealed, "It's quite obvious for an all-girls school, but I was surprised that there are no men's restrooms! I had to go all the way to the faculty room." Meanwhile, Takagi Manpei laughed as he said, "Not only in Japan, but let's spread the word of the host club throughout the world." Finally, Yamamoto promoted the film by saying, "The movie is dynamic and entertaining. Please look forward to it." The story of "Ouran High School Host Club" revolves around a high school host club, where a female student named Haruhi (Kawaguchi Haruna) disguises herself as a male host in order to pay off her debt from a broken vase. The movie will show a love triangle between Haruhi, the head of the host club Tamaki (Yamamoto Yusuke), and an exchange student from Singapore named Michelle (Shinoda Mariko). "Ouran High School Host Club" will open in theaters on March 17th.